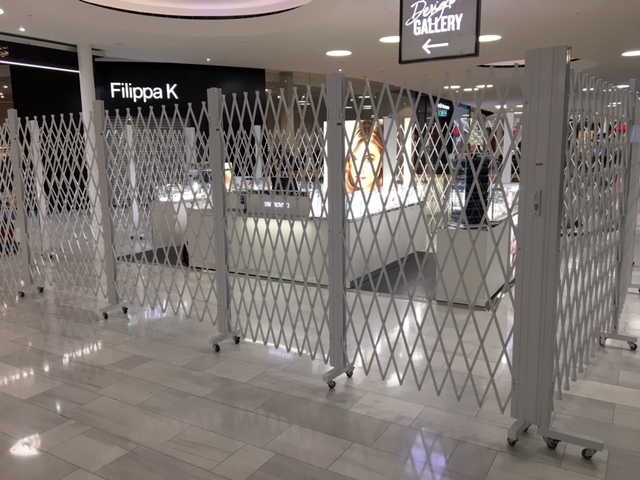 The Swarovski Group have recently installed white powdercoated expandable gates at one of their new stores in Stockholm, Sweden. Swarovski, which is a global corporation, is a European producer of crystal jewellery and accessories and is headquartered in Wattens, Austria. With over 2800 stores in more than 170 countries, Swarovski employs more than 27000 staff and has annual revenue of over 2.6 billion Euros. The expandable gates installed by Swarovski are mobile and trackless and have been configured in a multi-angled shape to accommodate the unique layout of the storefront. Being trackless and free standing, these expandable gates require no overhead support structure making them easy and economical to install since no structural bulkheads are required. Nor is any headroom required. Available in standard heights of 2020mm or 2520mm, the span of these expandable gates is unlimited due to their unique modular design and in this way the need for cumbersome and unwieldy removable mullions is avoided making it easy and safe for staff to operate. The expandable gates blend in with the aesthetics of the storefront with their high quality gloss pearl white powdercoated finish and sharp precision angled lines. Fabricated from precision engineered steel sections and with multiple locking options, these expandable gates are compact, secure and strong yet are lightweight to operate running on a series of heavy duty 75mm bottom thermoplastic rubber non marking castors. Both steel and aluminium expandable gates are available depending on the application with the latter more suitable for installation in a highly corrosive marine environment. For further information on the aluminium expandable gates including specifications and images view our page here. OH+S tested for safety and with a detailed, written and independent WHS Risk Assessment, The Australian Trellis Door Company™’s (ATDC™) expandable gates are stand out leaders in the field and are also independently tested for dynamic impact, simulated climbing and wind force overturn conditions under the Australian Standard AS 4687-2007 Temporary Fencing and Hoardings Further testing has been successfully completed for emergency egress under the Building Code of Australia where required. For further information on recent and successful temporary fencing tests please refer to article at here. Ideal applications for ATDC’s expandable gates are to achieve temporary lockup for pop-up stores, kiosks and other temporary tenancies, access control for shopping centres and public buildings (such as railway stations and passenger terminals for instance at airports, ferry stations), Worksafe applications such as construction sites, events, entertainment venues, securing factory warehouses and loading docks. ATDC’s expandable gates are also available for hire on a long, medium term or short term basis. For further information on some of these safety applications please read our article here. For more information on ATDC’s expandable gates please contact ATDC toll free on 1800 657 435 from anywhere in Australia or visit our website here.